Marina WiFi � Good For Business! The need to say connected is growing at an astounding rate. Increasingly, people are making decisions about where to stay and how long to stay based on the availability of WiFi access. And boaters are no exception. Marina's that recognize this demand and support the needs of their customers by investing in WiFi for their marina will have an important competitive edge. Whether you cater to transient, seasonal, or year round marina clients, the need for marina WiFi access will increasingly shape their decisions about where to dock their vessels. In addition to attracting new customers and maintaining existing ones, flexible access fee models can help you decide whether to charge customers for WiFi access, and if so, how much to charge. So incorporating WiFi Access at your Marina can also help your bottom line directly. At ACF we provide full service Marina WiFi solutions that you can count on. 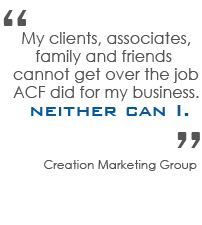 ACF's expert consultants recognize that no one knows your business better than you do. We provide one on one consultation so we can fully understand your marina's particular characteristics and needs. Our goal is to provide a WiFi system at you marina that exceeds the expectations of both you and your clients. By providing the full range of Marina WiFi products and services, ACF saves you time and money. Our integrated approach also eliminates the frustration of dealing with multiple vendors and multiple bills. An administrative access portal enabling you to add and delete accounts; review WiFi usage; see revenue reports; and determine what clients see when they log as well as payment options if any.